Bonanza! That was the exclamation when a large vein of valuable ore was discovered. Thousands of optimistic Americans and even a few foreigners dreamed of finding a bonanza and retiring at a very young age. 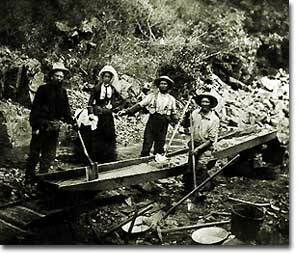 Ten years after the 1849 California Gold Rush, new deposits were gradually found throughout the West. Colorado yielded gold and silver at Pikes Peak in 1859 and Leadville in 1873. Nevada claimed Comstock Lode, the largest of American silver strikes. From Coeur d'Alene in Idaho to Tombstone in Arizona, boom towns flowered across the American West. They produced not only gold and silver, but zinc, copper, and lead, all essential for the eastern Industrial Revolution. Soon the West was filled with ne'er-do-wells hoping to strike it rich. Few were so lucky. The chances of an individual prospector finding a valuable lode were slim indeed. The gold-seeker often worked in a stream bed. A tin pan was filled with sediment and water. After shaking, the heavier gold nuggets would sink to the bottom. Rarely was anything found of substantial size. Prospectors like Potato Creek Johnny looked to strike it rich with a bonanza. Johnny gained fame when he found one of the largest nuggets of gold on record. Once the loose chunks of gold were removed from the surface, large machinery was required to dig into the earth and to split the quartz where the elusive gold was often hidden. This was too large of an operation for an individual prospector. Eastern investors conducted these ventures and often profited handsomely. 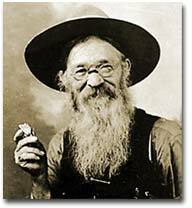 The best case scenario for the prospector was to locate a large deposit and sell the claim. Those who were not as lucky often eventually went to work in the mines of the Eastern financiers. Western mining wrought havoc on the local environment. Rock dust from drilling was often dumped into river beds, forming silt deposits downstream that flooded towns and farmlands. Miners and farmers were often at loggerheads over the effects of one enterprise on the other. Poisonous underground gases, mostly containing sulfur, were released into the atmosphere. Removing gold from quartz required mercury, the excess of which polluted local streams and rivers. Strip mining caused erosion and further desertification. 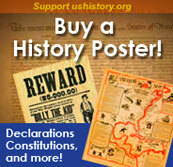 Little was done to regulate the mining industry until the turn of the 20th century. Each mining bonanza required a town. Many towns had as high as a 9-to-1 male-to-female ratio. The ethnic diversity was great. Mexican immigrants were common. Native Americans avoided the mining industry, but mestizos, the offspring of Mexican and Native American parents, often participated. Many African Americans aspired to the same get-rich-quick idea as whites. Until excluded by federal law in 1882, Chinese Americans were numerous in mining towns. The ethnic patchwork was intricate, but the socio-economic ladder was clearly defined. Whites owned and managed all of the mines. Poor whites, Mexicans and Chinese Americans worked the mine shafts. A few African Americans joined them, but many worked in the service sector as cooks or artisans. It is these mining towns that often conjure images of the mythical American Wild West. Most did have a saloon (or several) with swinging doors and a player piano. But miners and prospectors worked all day; few had the luxury of spending it at the bar. By nighttime, most were too tired to carouse. Weekends might bring folks out to the saloon for gambling or drinking, to engage in the occasional bar fight, or even to hire a prostitute. Law enforcement was crude. Many towns could not afford a sheriff, so vigilante justice prevailed. Occasionally a posse, or hunting party, would be raised to capture a particularly nettlesome miscreant. When the bonanza was at its zenith, the town prospered. But eventually the mines were exhausted or proved fruitless. Slowly its inhabitants would leave, leaving behind nothing but a ghost town. Boom and bust in four short years. With several original photos and lots of interesting text, this webpage tells the story of a California goldmine ghost town. The Comstock Lode was the most important silver discovery in the West, spawning towns, a major city and many millionaires. This excellent article by Elizabeth Gibson gives the details. "Good-bye God, I'm going to Bodie" -diary entry of little girl whose family was moving to the wickedest town in the West.